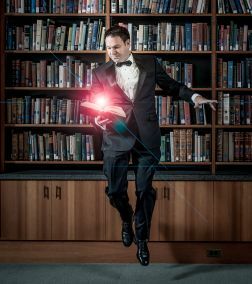 Robert Strong – The Comedy Magician has been entertaining since 1985. He has performed on national television, in all 50 states, in 47 countries, and twice at the White House. He was a 10 year artist in residence at The Smithsonian and regularly leads workshops at Singularity University, Stanford University, and at Google. He was twice voted San Francisco’s Best Comedian and twice voted San Francisco’s Best Magician. He was a co-producer of MotionFest West, is an instructor at the Circus Center in San Francisco, and was the host of Comedy Talks: Conversations with the Legends of Comedy. One of the highlights of his career was opening a number of times for comedy legend Robin Williams. You can see his recent TEDx San Francisco talk here: https://www.youtube.com/watch?v=TfIR8TaWrnM and check out the website.